Are you thinking about a career in IT support? Or are you looking to formalize and improve your company’s current IT support capabilities through the introduction of an IT help desk structure? Either way, you probably want to understand more about how the roles/people in IT help desks (or service desks), and the wider support ecosystem, are organized and work. Plus, the sorts of skills and capabilities they need. 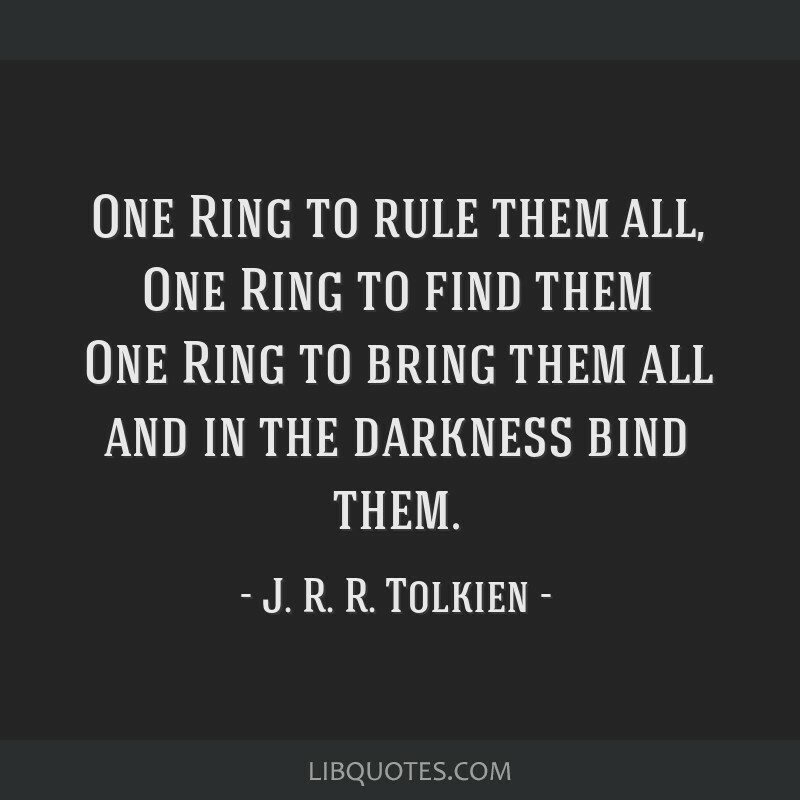 If you recognize this Lord of the Rings pun, then you would probably do well in IT support. This aside, it’s important to understand that different organizations will shape their IT support capabilities in different ways (plus, they might call it a help desk, service desk, or something else). As you would expect, each organization will work in the way that’s best suited to their business needs. I’ll cover each of these separately including the common roles and what they entail. The IT help desk is the public face of the IT organization and IT support. It’s the initial point of contact for end users/customers when they have an issue, need help, need something new, or need something changing (unless there’s also an IT self-service capability, which is usually a must-have these days). It’s therefore considered 1st-level support and might also be called first-line, Level 1, or Tier 1 support. There are two main help desk roles, with additional experience- and responsibility-related variations. The first is the Help Desk Manager. This role might also be called Head of Help Desk, Help Desk Leader, or similar. This role is responsible for the overall operation of the help desk, the management and development of people, the achievement of help desk key performance indicators (KPIs), and ongoing improvement activity. People in this role will also deal with service-based escalations including complaints. There might also be other responsibilities. For instance, supplier management – including the relationship with the provider of the help desk tool. And, as you would expect, the role requires both people and operational management skills and capabilities. The second main role is Help Desk Agent. These are the people responsible for dealing with the issues and requests presented, by end users, to the help desk. The use of a fit-for-purpose help desk tool helps them perform their responsibilities in terms of workload management and organization, while also providing quick access to important scripts and knowledge base articles. The role requires some technical knowledge, but this can be heavily supplemented by the aforementioned scripts and knowledge base articles (as well as the ability to hand off to 2nd-level support). Communication skills are critical – such as interpersonal skills and writing (for emails and ticket creation/updates) – but customer service skills and empathy are increasingly sought after in these days of offering great customer/employee experiences. Technical Specialists – in larger teams there might be Help Desk Agents who are differentiated because of their deeper knowledge of certain technical or even business areas. Some tickets might be automatically allocated to these people, but they could also be viewed as quasi-2nd-level support personnel in some organizations. Senior Help Desk Agents – these are often promotion-based roles that reflect the current employee’s increased experience and technical knowledge. They too might fulfill some 2nd-level support responsibilities. Help Desk Supervisor (or Help Desk Leader) – in larger help desk teams there will be “span-breaker” roles such as this that sit between the Help Desk Manager and Help Desk Agents. The supervisors will take on some of the management responsibilities of the Help Desk Manager and need to be skilled accordingly. Please note that if the help desk has a self-service/help facility, then this is viewed as Level 0 support. Finally, if you want to know the difference between an IT help desk and a service desk, then I have you covered with: You Say Tomato: Help Desk vs. Service Desk. If an issue or request can’t be dealt with by the help desk, then it’s passed to 2nd-level support. 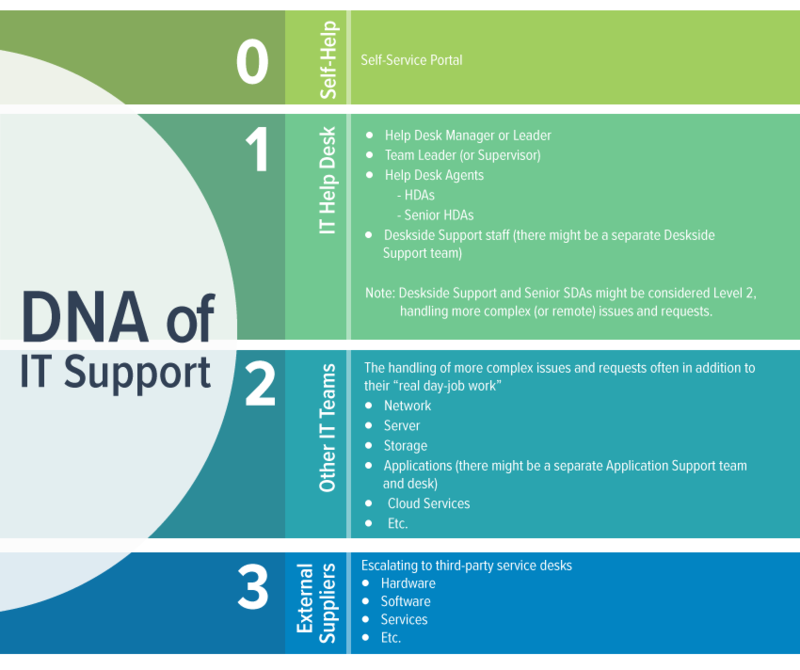 Where the line is drawn between 1st-level and 2nd-level support will depend on the local help desk set up. For instance, in some organizations the help desk will deal with only the simplest of tickets, usually where the Held Desk Agent can resolve, or provision, the tickets using scripts and knowledge articles. Whereas, other help desks will have staff that are capable of going “off-script” to solve new issues for which there is no existing resolution guidance. 2nd-level support is usually made up of staff in other technology-domain-based teams – such as the network team, server team, or storage team. These people have non-support-related “IT day jobs” and pick up any tickets, pertinent to their domain knowledge, that can’t be dealt with by help desk personnel. There are two other common 2nd-level support teams. The first is application support. This can be an alternative help desk and is usually found in larger organizations that have a large portfolio of business-critical, possibly bespoke, applications. They not only deal with application-based issues but also provide advice such as responding to application-related “How do I?” questions. Given that end users can also contact application support directly, rather then being passed over by the help desk, some organizations might not view it as 2nd-level support. The second is deskside support, which is covered next. I’m giving it its own section, outside of 2nd- level support, because some organizations run it as part of the IT help desk and might consider it to be Level 1 support. In all instances, 2nd-level support personnel have a high degree of technical knowledge and experience. Deskside support is a “mobile” support team that provides in-person, usually “at desk,” resolutions and provisioning. They are directed by the help desk (through ticket assignment), and are thus a 2nd-level support team, but it’s worth thinking of them slightly differently as they might also form part of the wider help desk organization (and Help Desk Agents might sometimes also fulfill deskside support roles). Deskside Support Agents might diagnose the end-user issue, but they can also act solely as the “remediation agents” for Help Desk Agents who need something physical changing such as a repair (or to change something else that can’t be done remotely). Deskside support personnel also have a high degree of technical knowledge and experience – they will probably spend all day installing and fixing things such as PCs, mobile devices, printers, etc. This is one of those “it depends” scenarios. In some organizations, 3rd-level support is the development team. While in others this is 2nd-level support. It doesn’t really matter how you define each level as long as everyone within the organization knows “what is what” when it comes to IT support responsibilities and escalation paths, and all issues and requests are swiftly routed to the right resolution group. Then, you have another scenario, where sometimes an organization’s IT support and various subject matter experts (SMEs) are unable to resolve an issue – either due to a lack of knowledge or it being out of their control/ability to address the issue. This is where supplier support capabilities come in, with it commonly known as 3rd-level support. Or 4th-level support if the development team has dibs on 3rd-level support. Again, the people in these support teams have a high degree of technical knowledge and experience. But above all of this – as a prospective Help Desk Agent (or someone setting up a new help desk), it’s super important for you to know that it’s simply good practice for the help desk, and the original agent, to always think about your end users and maintain responsibility for them and their issues wherever they might be passed, across any of the above-mentioned teams. You must ensure, whenever possible, that the end user is kept informed and the ticket is closed in line with agreed service-level targets! I hope you found this blog interesting (and helpful). If you have any questions, or would like to share something about the DNA of IT support that I missed, then please let me know in the comments below. As SysAid’s Content Marketing Manager, Dena values most her friendships and daily conversations with the awesome IT service management (ITSM) authorities from all over the world! As they share their knowledge with her, she enjoys paying it forward to the IT community at large. Outside of work, she’s most likely at the gym, the beach, or at home watching a movie and spending time with her family.